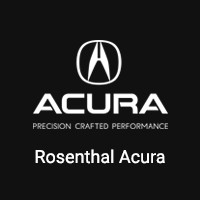 Since 1986, Rosenthal Acura has provided top-of-the-line vehicles with service to match. Our dealership has received Acura’s highly coveted Precision Team Award for total client satisfaction 25 times, and we are proud to be the only Acura dealership to achieve this honor for 22 years in a row. Stop by our dealership to see what makes us award-winning. Our sales staff is on hand to help you shop smarter. We’ll help you get a great deal on a new Acura or a Certified Pre-Owned vehicle. Be sure to look into our current offers and incentives for even more savings. When you find a vehicle that piques your interest, schedule a test drive with a friendly member of our sales staff. And the savings don’t stop after you choose your car – stay up to date on our service specials so you can save on maintenance from our trained technicians. Our finance department is also on-site to help you save more money over time with competitive financing rates. Work with our finance team to find the best lease or loan for you. Are you ready to save money, but still receive exceptional customer service? Visit Rosenthal Acura today. Our sales, finance, and service staff will work with you to make sure you get the best deal on your next vehicle, and keep getting the best deals on service after it’s on the road. Come by our showroom at 623 N Frederick Ave, Gaithersburg, MD, or contact us online with any questions!